Costco sells a roasted chicken & Swiss roll-ups platter that “stays” together and looks so appealing! 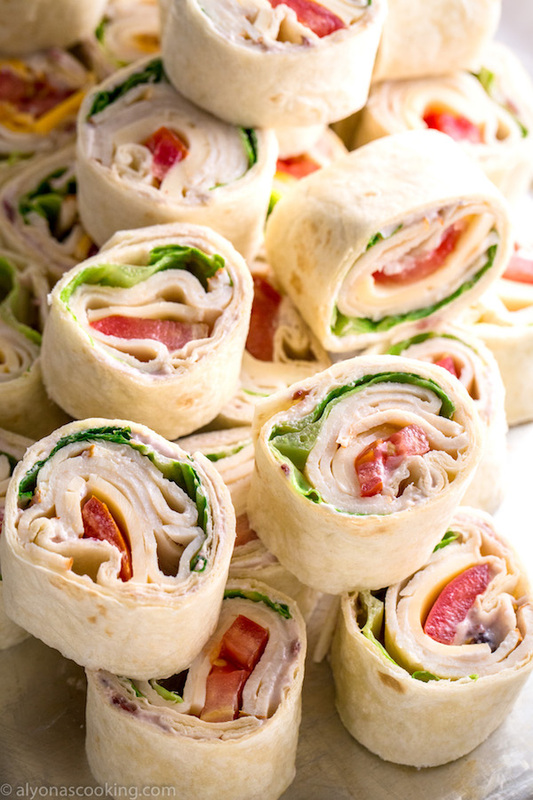 Make it with turkey if you insist but this is a roll ups recipe to try! The cream cheese spread helps the rolls stay together without any toothpicks and it pairs so well with the meat! 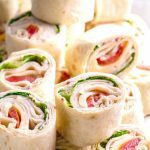 I actually bought a roll-ups platter from Costco before and have been wanting to replicate their version. It seems easy considering roll-ups have only a handful of ingredients and what can be so complicating about it? Why not make your own? Besides it’s more efficient making your own. A platter costs $9.99 and it seems like it carries about 3 rolls sliced, when you can make 10 rolls from a pack of tortillas. It turns out the homemade cranberry cream cheese spread tastes SO much better than the store bought one and did you know you can make a super quick jellied-like cranberry sauce from Craisins without any thickeners or pressure cooker right at home?! Try it for yourself, it can be made within 5 minutes and tastes like a Restaurant style jellied cranberry sauce! A thick spread helps the rolls not to unroll on you and this combination works wonderfully together. A great way to feed a crowd and left overs can always be served for lunch! 1. 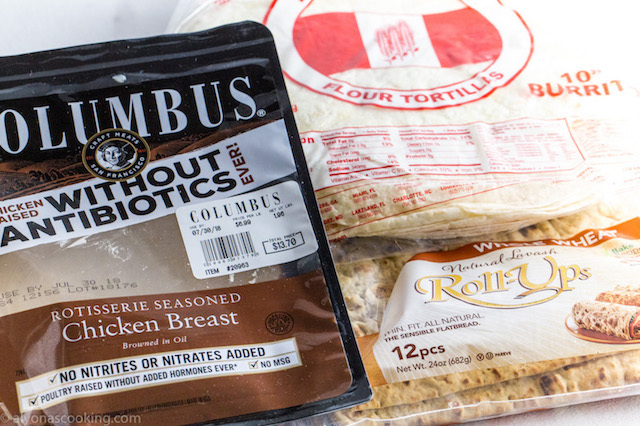 Spread 2 TBSP of the cranberry cream cheese spread onto each tortilla going to the edges. Place 2 pieces of romaine lettuce onto the center and top with 2 meat slices, 2 slices of swiss cheese and 3 tomato halves. 2. Roll the bottom edge of the tortillas over the toppings and roll tightly. Cut each roll into 8 equal pieces. Refrigerate at least a few hours before serving. 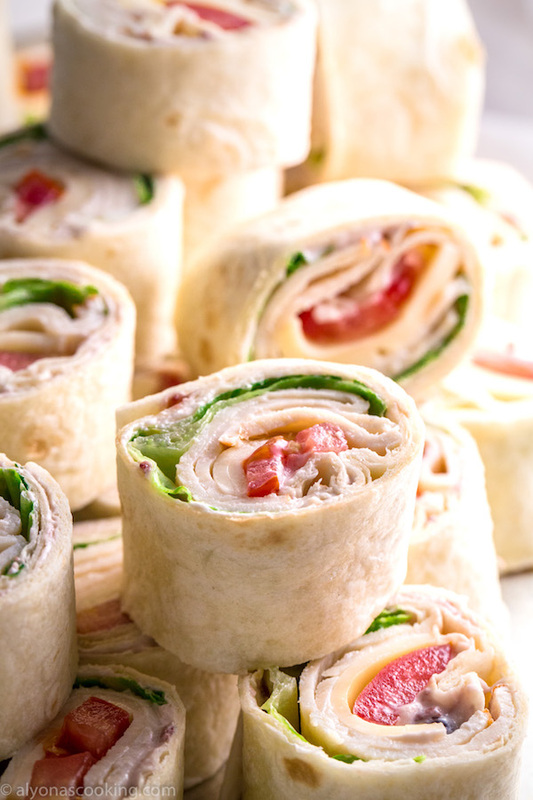 Costco sells a roasted chicken & Swiss roll-ups platter that "stays" together and looks so appealing! 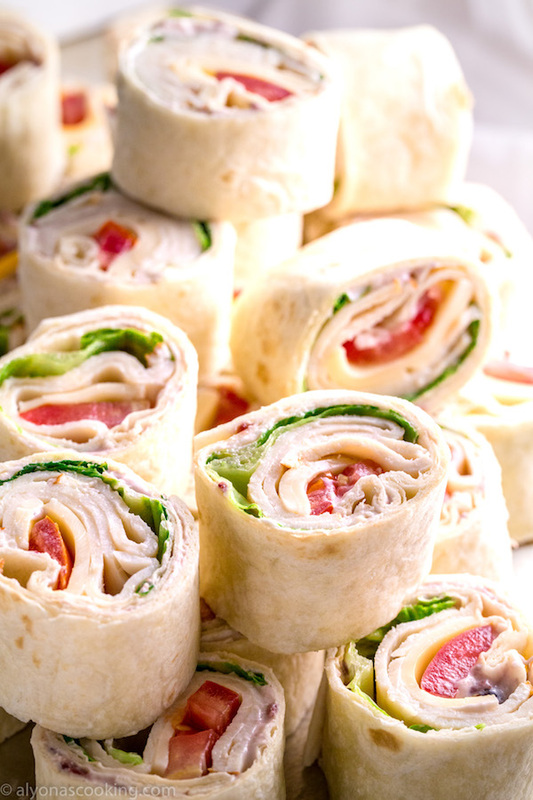 Make it with turkey if you insist but this is a roll ups recipe to try! 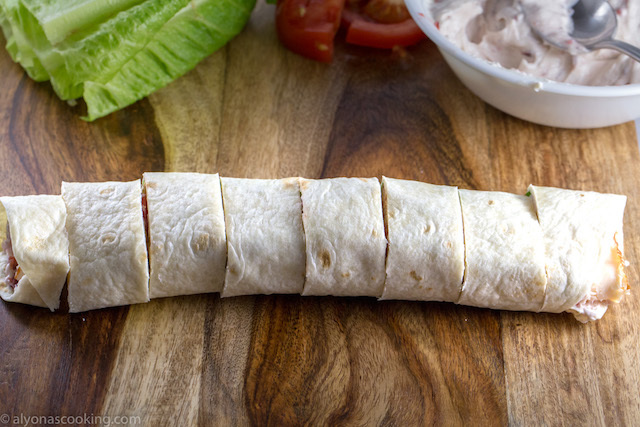 The cream cheese spread helps the rolls stay together without any toothpicks and it pairs so well with the meat! 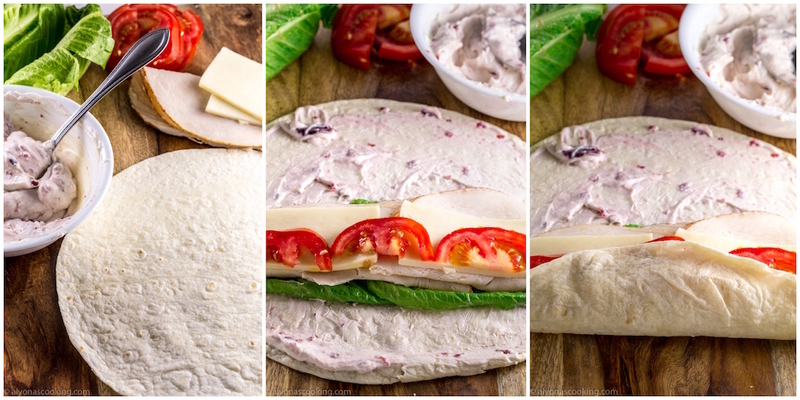 Spread 2 TBSP of the cranberry cream cheese spread onto each tortilla going to the edges. Place 2 pieces of romaine lettuce onto the center and top with 2 meat slices, 2 slices of swiss cheese and 3 tomato halves. Roll the bottom edge of the tortillas over the toppings and roll tightly. Cut each roll into 8 equal pieces. Refrigerate at least a few hours before serving.